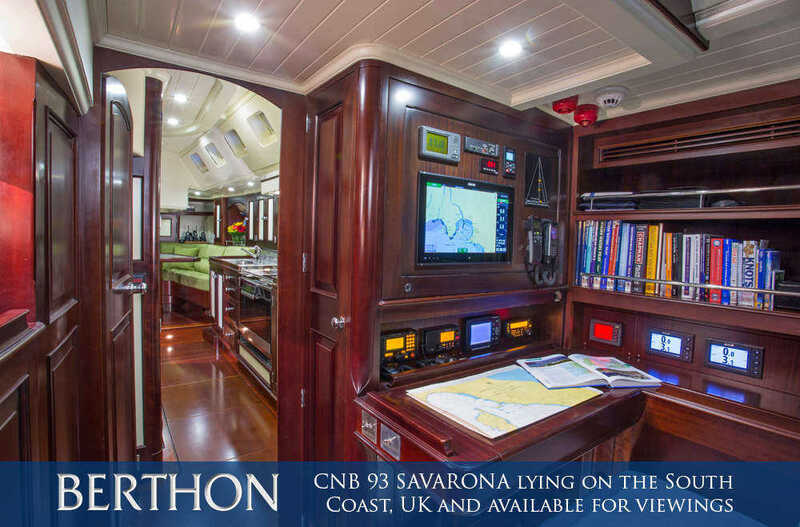 Having overwintered in the West Country of the UK, CNB 93 SAVARONA is coming up to Portsmouth to lift out for spring maintenance and will be available for inspections in this central location as of – April 9th 2019; heading back in water 19/20th April and directly to Plymouth, UK. 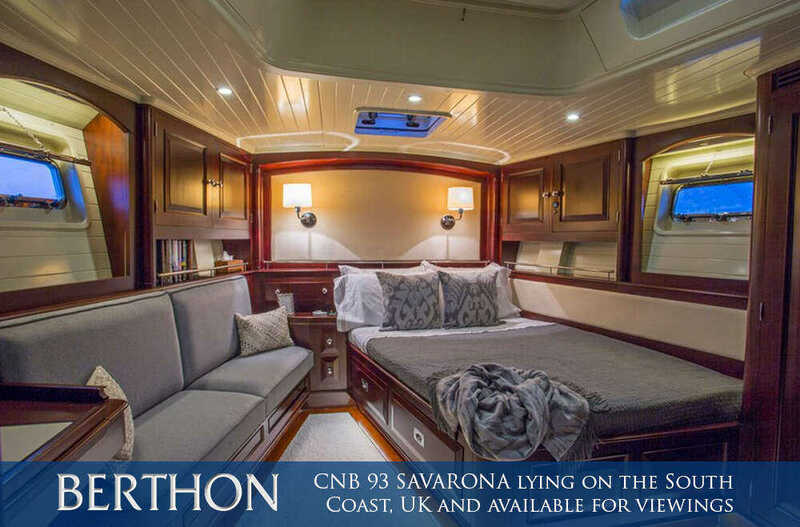 SAVARONA is a Briand design that was totally refitted in 2016 with new paint, decks, rigging, hatches, machinery, electronics, electrics and interior. She has been immaculately maintained and her centreboard gives her huge versatility in a cruising role. SAVARONA is coded and fully charter ready. Recently reduced in price she now asks US$1,950,000 which is but a proportion of her refit cost. SAVARONA offers wonderful flush decks with two comfortable cockpits. The sailing cockpit has ample room for sailors and guests with easy access to the crew accommodation aft. The guest cockpit has a lovely table and is an elegant place to spend time and for alfresco eating. She has a substantial dinghy garage that houses her jet rib. Look afloat and you see a fantastic carbon spar, which has recently been serviced. If you step below down the main companionway you find yourself in a generous main saloon designed by Danet with high gloss mahogany and white trim. There is a clever use of fabric and colour throughout. To port is a generous dining saloon for less clement weather and to port a seating area with lounging space to relax or take in a movie. The owners’ cabin is forward with lots of storage and his and hers en-suite heads. There are two generous twin cabins, each with their owner heads and separate showers. Aft of the main saloon is a nav. station and office with a door into the large and well-equipped galley. All the equipment here was replaced in 2016. Opposite this is access to the engine room which is forensically clean and much of the equipment is new. Aft of the galley is a generous crew mess with a double captain’s cabin and a further twin crew cabin with heads compartment with shower. Here there is separate access onto the deck. 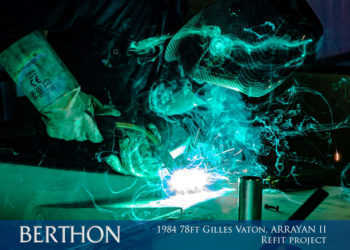 She is a superb fast, and capable family sailing yacht which is ready for new oceans. 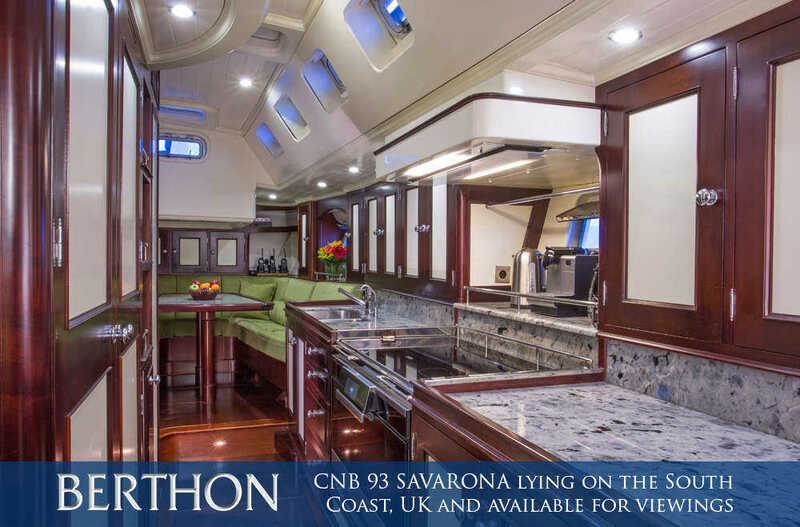 For further information about SAVARONA contact jennifer.stewart@berthonusa.com. For local information about inspection on the UK South coast contact sue.grant@berthon.co.uk.